Fished a half-day morning “Kids Fish, Too!” trip with two young men from Harker Heights — Wes P. and Isaac C. They live right down the street from one another and go to church together and are pretty good boys. We experienced a mix of light topwater and solid mid-depth downrigging today. WES & ISAAC AND A FEW OF THE 42 WE BOATED ON THIS HOT JUNE MORNING. “MR. BOB”, AS THE BOYS CALLED ME, AND ONE I TOOK TOPSIDE WITHIN 15 FEET OF THE BOAT — SOUNDED LIKE A GRENADE WENT OFF! Wind: Winds were very light from the SSW at sunrise, then around 8:15, turned W, then WNW and picked up speed until around 10:45 when they again slackened. Skies: Skies were fair at sunrise. There was no cloud cover whatsoever today. Once the sun got up it burnt off the little moisture there was in the air and the skies went clear until a windshift in the afternoon clouded things up. Environmental Note: This was to be the 1st day of the last 16 not to reach 100+ degrees, as a cool front dropped in turning winds N and creating cloud cover. As we headed out today we initially searched for topwater action and, as expected on a slack wind, saw little at both Area 056 and in the vicinity of Area 061. Around 7:15, still in the vicinity of Area 061 to 062, a few single largemouths and a few wolfpacks of them began to push shad around. This was very widely distributed and the fish were very particular and did not stay on the surface very long. We stuck with sight casting for just shy of an hour during which time the boys, both amateur casters, only managed one fish, while I only fooled 4. This was too tough to stick with despite the regularity of sightings. I then trained the boys up on downrigging and they caught on pretty quickly. We were staggering our weights at 25 and 27 feet and immediately got into fish in an area bounded by Area 070 to the north, Area 071 to the east, and Area 467 to the west. The 45 foot mark was our southerly boundary. We took some very solid 14+ inch white bass and some barely keeper sized schoolie largemouth at a ratio of 3 or 4 whites to every one largemouth. We stuck with downrigging from around 8:15 to about 9:30 when a fairly sudden wind shift to the west, accompanied by an increase in wind speed, spurred a brief flurry of topwater action by both largemouth and white bass. Despite the aggressive nature of the fish, the results were similar — I was doing all the catching (3 more black bass in about 8-10 minutes) and the boys were missing their targets — so, we stuck with our strong suit and went back to downrigging. We got right back into the fish at mid-depth and, by 10:45 had put together a total sack of 42 fish including largemouth, white bass, and one token drum. 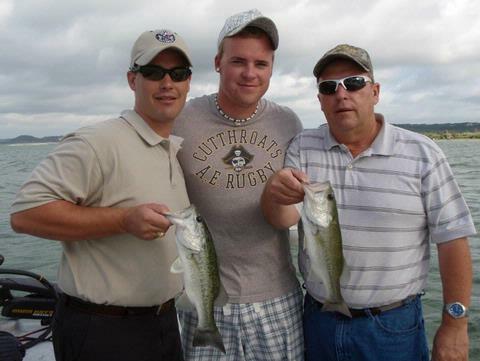 Fished a half-day morning “S.K.I.F.F.” trip on Stillhouse with brothers David and Jonathan Dalcourt of Harker Heights. This was the third S.K.I.F.F. trip that I’ve run. S.K.I.F.F. stands for Soldiers’ Kids Involved in Fishing Fun. The Austin Fly Fishers (AFF) have commissioned me to take the children of soldiers deployed in harm’s way and the children of soldiers killed while on active duty on guided fishing trips. S.K.I.F.F. trips are funded by donations both given by and collected by the members of the Austin Fly Fishers. The boys’ dad, Lieutenant Colonel Charles Dalcourt Jr. is serving with 1-227th Headquarters and Headquarters Company, 1st Air Cavalry Brigade, 1st Calvary Division, out of Camp Taji, Iraq. This is his 2nd tour to Iraq. 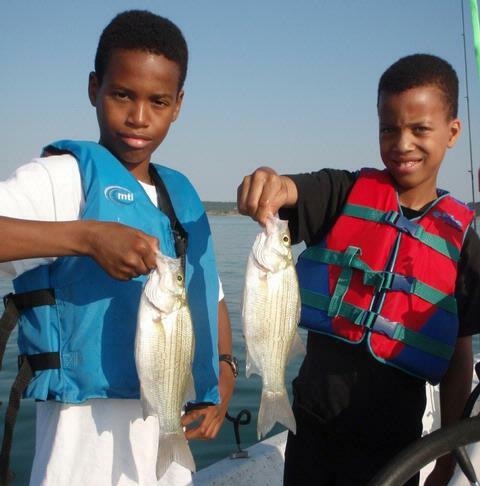 DAVID AND JONATHAN WITH A PAIR OF HEALTHY WHITE BASS TAKEN ON DOWNRIGGERS THEY SET AT AROUND 26 FEET DEEP. Wind: Winds were flat calm with only an occasion puff from the SSW. Skies: Skies were clear with 10% cotton ball clouds here and there. I picked the boys up and it was off to Stillhouse to start our big adventure. Casting lessons were the first order of the day. 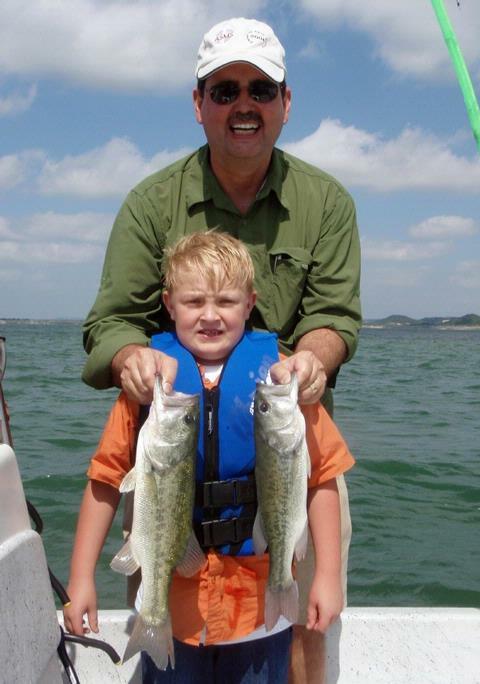 I chose closed face reels for the boys as they told me they had little fishing experience. They were fast learners and soon the were launching 60-70 foot cast and fairly straight at that. Next we talked safety and then it was out to the fishing grounds. At Stillhouse in the summer no wind = no topwater and today was no exception. It was obvious that we needed to start at mid-depths and so we got the downriggers down doing what they do best and immediately began putting fish in the boat. 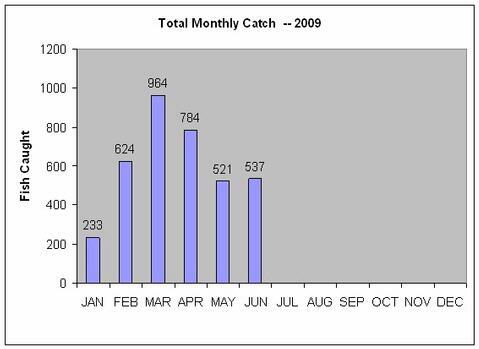 I noted two concentrations of boats where “last weekend’s” fish were (Area 222 and 061), but those fish were long gone. We opted to avoid the crowd and slipped off by ourselves to between Areas 452 and 453. With the riggers set at 24 and 27 feet, we caught 1 drum, 3 largemouth, and 6 white bass in right at an hour. Things then got a little quiet so we headed out to look for more bait and gamefish on sonar. We looked over Area 462 and found little. We then went to between Areas 056 and 126 and, as we were idling in, saw occasional small, single largemouth popping shad on top. I could tell by looking at these that they’d present a marginal opportunity for casting, but we went ahead and tried it so at least the boys would get some casting under their belt. I worked a Cork Rig and caught 2, they threw Krocodile’s and each hooked but lost 1 — all short largemouth. So, we went back to downrigging and, over the next 2 hours boated 15 more gamefish (10 largemouth, 5 white bass), all on Pet Spoons and with all the downrigger work done by the boys — I just steered and used sonar to keep us in the fish — great teamwork!! By around 10am I let the boys know we’d likely have active fish for another hour based on when the fish shut down on trips run earlier in the week. I gave them the option of continuing what we were doing or of bobber and bait fishing for a change of pace. They went with the latter option. We headed to Area 203, broke out out the floats and nightcrawlers and got both boys accustomed to placing their baits where the fish were — in cover and in shade — and they did well, landing 5 fish each including 2 blacktail shiners and 8 bluegill sunfish. By 11:15 it was already in the 90’s, there was not breeze and all 3 of us were sweating through our clothes, so we wrapped it up with 36 fish to show for our efforts. Tomorrow the boys head to Piney Woods summer camp. I suspect they’ll be inquiring as to whether there is any fishing tackle available for signout!! 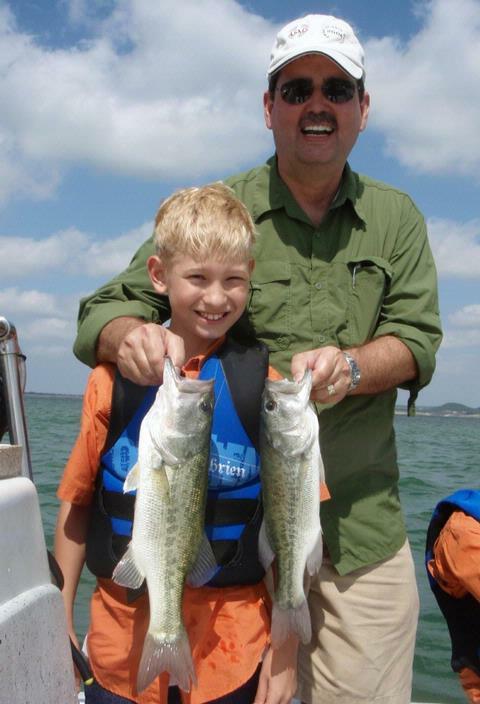 Fished a morning “Kids Fish, Too!” trip today with Josh Bitle and his sons, Nicholas (10) and Taryl (7). Josh just got back from Iraq and his nice wife, Vesper, planned this trip about 3 months in advance just waiting for his return. Nicholas helped me work the downriggers today with solid results! Taryl, a non-morning person, pulled in a few while struggling to keep his ‘lids open! Wind: Winds were flat calm for about the first 90 minutes of light, and then picked up from the ENE at only 3-4. It was bound to happen sometime … the topwater party ended with today’s flat calm and bright start, followed up by an E. wind forecast to persist into the following day. I was really hoping to get these boys into an aggressive school or two of whites or black bass, but it wasn’t in the cards today. After about 20 minutes of looking, listening, and glassing, it was apparent that the bite was off. We saw single fish popping here and there, but no manner of surface schooling, so, we switched over to the downriggers and stayed in this general vicinity (Area 061) to see if anything would develop on top. Topwater never did materialize, but the fish were feeding moderately at depth. We ran the ‘riggers between Areas 061 and 059, between Areas 467 and 468, and again from Area 458 halfway east to 457. All three area held solid concentrations of fish and the key depth was 26-27 feet today. 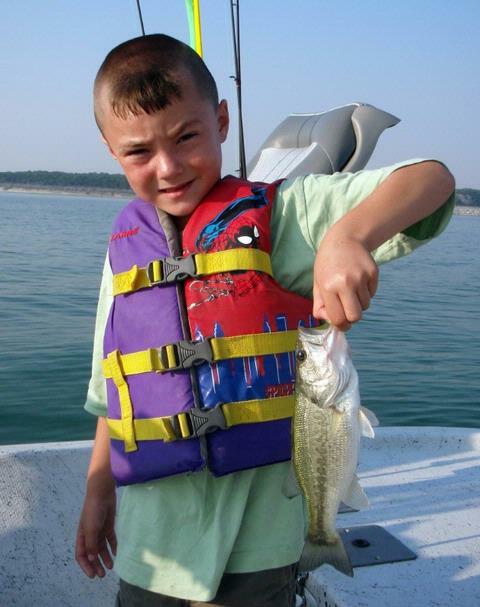 We’d put exactly 20 fish in the boat, all on Pet Spoons, when I asked Nicholas (as Taryl was napping heavily by now) if he’d like to continue catching numbers of fish on one Pet Spoon and try for fewer but larger fish on a large crankbait. He opted for this crankbait approach and was almost immediately rewarded with the biggest fish of the day to that point, a 2.25 pound largemouth. Later, at Area 458, after sticking with that decision, he bagged the biggest fish of the trip, another largemouth going 2.75 pounds. We wound up catching a total of 30 fish on downriggers, including a 30%/70% mix of largemouth bass/white bass, as well as one drum. Because this downrigger fishing is quite techical, we decided to end the trip doing something low tech that the boys could duplicate the next time the go bank fishing, etc. We baited up the bream rods and worked over some sunfish at Area 239. In the time it took me to get the boat ready for trailering, the boys caught 19 sunfish, including a mix of green sunfish and bluegills. All told, Nicholas and Taryl teamed up for 49 fish today. Dad was a great coach and encourager which helped a lot. Fished a half-day morning trip today with Steve Smith and his adult son, Eric. These fellows are from the great state of Wyoming. Steve is a contractor working in the oil drilling industry, and Eric is a college student and National Guardsman. His unit is being sent to Iraq, so, he’s put life on hold for a while to serve his country and is now stationed at Ft. Hood for training before he deploys. Both fellows have done a good bit of north country fishing – lake trout, pike, walleye, and even some excursions to Alaska. I tried my best to give them a good impression of what Texas has to offer. 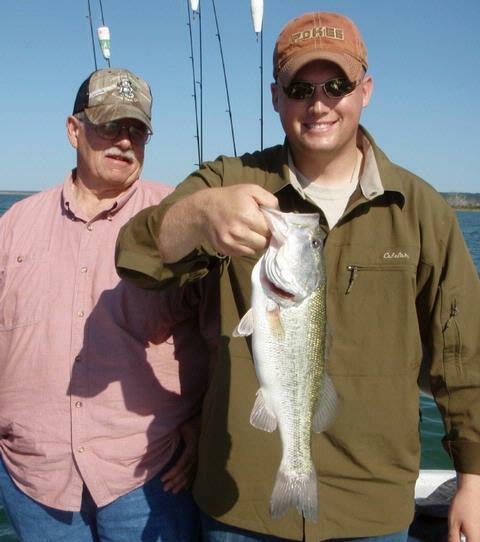 Steve (in background) and Eric with a nice black bass. A 3.25 pound black bass with the quarter-pound bait he wolfed down. Wind: Winds were light from the S at around 3-4 at the start of the trip; they then slowly built up to a peak of about 8mph. Light winds on clear, hot days can be a bad combination. Fortunately, as the winds peaked, they also turned SSW and the fishing stayed solid. Skies: Skies were fair at sunrise. There was no cloud cover whatsoever today. Once the sun got up it burnt off the little moisture there was in the air and the skies went clear all day. As has been the rule for the past 2 weeks, the fish began to feed on the surface in the vicinity of Area 057 right at around 6:45a and stayed active today until 8:55. 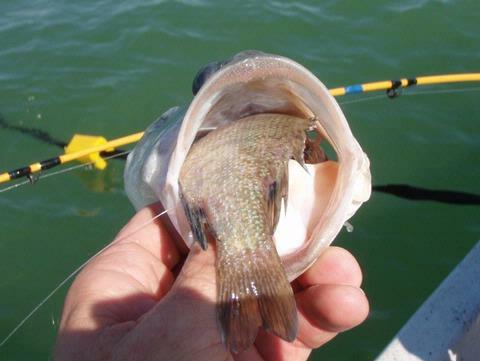 The first 25 to 35 minutes have been most intense as both white bass and largemouth feed. Once the light level gets to a certain point the whites drop down in the water column leaving just the largemouth to target on the surface. The largemouth fishing then grows spotty past this peak until it gradually tapers to zero. Due to the nearly flat, bright conditions, the fish were difficult to fool with artificials today. We used the Cork Rig with downsized offerings on the business end to match the forage size, but, even with that done the fish were very particular. In a little under 2 hours of fishing we took 14 fish off the top. This was substantially fewer fish than we’ve taken during this early morning feed lately, and that was with 2 fairly good casters on board. We put 9 largemouth and 5 whites in the boat before the topwater period was over. Following that, we made 4 increasingly shallower drifts from SW to NE across Area 222 headed toward Area 007 baited up with live sunfish I’d caught before our trip. We had 6 strikes and landed 4 fish including 3 largemouth bass and 1 drum. The fish were fairly scattered and the action was slow to moderate, so we transitioned to downrigging for the remainder of our trip, beginning around 10:15 to 11:30. We downrigged in a N-S oriented elipse from Area 217 to Area 462 and found the fish concentrated on the E. facing slow on the W. side of the midline of this underwater feature. Fish were concentrated in a band from 26 to 30 feet deep with occasional more highly active wolfpacks of fish showing higher in the water column from 12 to 25 feet deep. We ran 2 sizes of Pet Spoons over these fish and did equally well on both. In a 75 minute span we put 28 additional fish in the boat including 2 largemouth, 3 drum, and 23 white bass. I noted that the drum all came on the occasions where I took us in a bit shallow on this bottom feature and the ball began rubbing bottom at 26-27 feet. We ran our balls at 26-27 feet for the first 2/3 of our efforts, then, as the wind slacked and the surface smoothed out letting the sun’s rays penetrate deeper, the fish moved another 1-2 feet deeper, and we then ran balls at 28-29 feet. The fellows were very satisfied with their catch and enjoyed one another’s company on the water today. Steve paid me a nice compliment on our way in .. now he’s a fellow of few words, but he makes those count. I asked he and Eric if they enjoyed their Texas fishing experience and Steve just said, “Bob, you’re our hero.” Eric then asked if there was any way I could officially notify his mom that they caught the great number of fish that they caught, thinking she’d be suspicious of a fabrication if they told her they’d put 46 fish in the boat. I think Eric had a notarized statement or something to that effect in mind … but I’m letting this blog entry serve that purpose! Eric, I hope you stay safe in Iraq and return to finish out your degree plan at school. Ya’ll are good people and represented Wyoming well! Fished a half-day morning Fathers’ Day trip on Stillhouse today with Chris Kerbow and his 10 year old son Cooper. I first met Chris at his restaurant, Catfish Parlour, off FM2338 in Georgetown. I’d taken my wife, Miss Rebecca, there for a Saturday “date night” and we had excellent food and excellent service in a nicely done setting, so, when I went to pay, I asked to speak to the manager intending to let him know that my first impression of his operation was that things were really squared away. To my surprise the owner was on site and came to speak with me — that was Chris. We compared notes about being in small business and, long story short, we visited about getting his boy Cooper on the water soon after school was out. Today was the day! The Kerbow Boys landed 61 today. Downrigging treated us the best with 27 feet being the magic depth. Wind: Winds were SSW at 9-13 the entire trip. Skies: Skies were partly cloudy in the morning with a grey cloud bank in the eastern sky. The sun rose above this within 10 minutes and very sparse clouds remained with mostly sunny, bright conditions the remainder of the trip. Due to the calmer and brighter weather forecast for today, we began a bit early today — at 6:20am, so we had a few minutes for casting lessons and could still get to the fish before they came up on topwater. The fellows both got the hang of casting both Spooks and Cork Rigs with spinning reels at dockside, so we ventured out. At 6:41am I spotted the first topwater school of white bass pushing shad. The topwater action waxed and waned but never stopped from then until 8:56am. During this time we fish both Area 057 and Area 466 and managed 19 fish on topwater by the time it all ended. The catch was a 1:2 mix of whites:largemouth. Once the topwater settled down, we headed to Area 239 where Cooper caught a few sunfish on a bream pole. We then headed back out onto the main lake to put those sunfish to work trying to catch something a bit larger. We drifted from SW to NE from off of Area 222 right up onto Area 007. Live bait fishing can be fun when the fish are really turned on to it, but today wasn’t one of those days. We spent about 20 minutes on a single, long drift and caught a nice largemouth and a nice white bass for our efforts, but decided to give something else a try once the novelty of that technique had worn off for Cooper. At 10:05 we began downrigging. We chose a N-S oriented elipse from Area 462 to Area 217 after seeing abundant shad and gamefish sandwiched between 26 and 31 feet deep all over this area. In summary, after 2 1/2 hours of downrigging, we had brought our 2-man tally up to 58 fish including a 4.25 and 4.75 pound largemouth, and several white bass over 15 inches. Just after noon things began winding down pretty quickly — I suggested the boys try to catch one more fish a piece on the downriggers and then we could head back to Area 239 to let Cooper do some more bream fishing as I got the boat neatened up, etc. 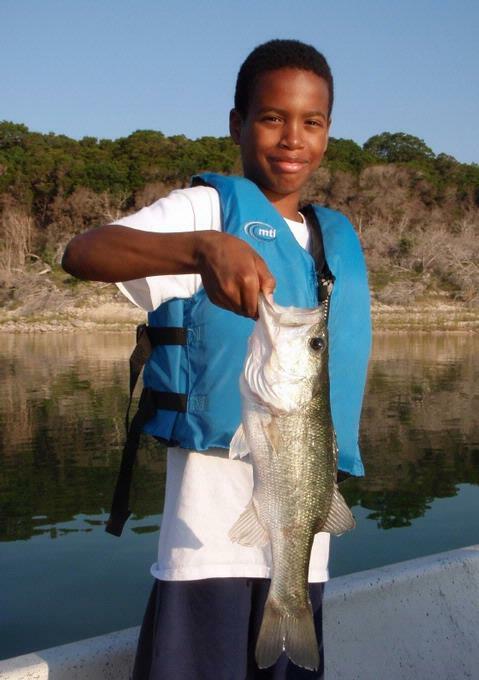 With that, Chris immediately hooked into a white bass, and caught and released it, then racked up his rod. Now, all eyes were on Cooper. We covered about 60 yards from where dad’s white bass had come over the side and then it happened — Cooper’s rod began jerking. He cleared the line and the fight was on. Moments later what came aboard for these fellows whose survival counts on catfish but a crankbait-busting channel cat of about 11 inches in length!! Kind of an appropriate ending to a great day on the lake with some good people. We packed up, got Cooper 3 more sunfish (a green, a bluegill, and a longear) and then called it a good day with 61 fish grand total to show for our efforts. Fished a half-day morning Fathers’ Day trip on Stillhouse today with 3 generations aboard — Grandpa Bob B., his adult son Wyatt B., and Wyatt’s son, 6 1/2 year old Austin B. Bob is retired Navy and now works for the USPS, Wyatt was just commissioned as a junior officer in the US Army as a Scout, and Austin is a Cub Scout who just made the A/B honor roll for a great end to his 1st Grade year. 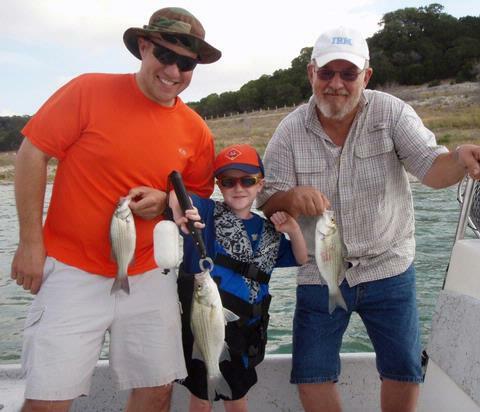 WINDY FATHERS’ DAY FISHING 2009 – L. to R. – Wyatt, Austin, and Bob with a variety of year classes of white bass. It was blowing so hard we had to seek calm water just to take the photos!! Wind: Winds were SSE at 14+ before sunrise, and increased to over 20mph by trip’s end. Skies: Skies were partly cloudy in the morning with a grey cloud bank in the eastern sky. The sun rose above this within 30 minutes and sparse clouds remained with mostly sunny conditions the remainder of the trip. I was to meet the boys at the boatramp at 6:30a in an attempt to get them on the very consistent topwater action we’ve been enjoying thanks to the stable weather conditions. The Army had other plans. Wyatt got one of those calls every lieutenant hates — a 4am call from the local authorities that a soldier was acting less then soldierly. He had to tend to business on Ft. Hood, so we pushed back the pickup time to 7:30. I was concerned that this would make it difficult to keep young Austin entertained as the topwater fishing tends to be a lot more enjoyable for the kids. I set out pre-dawn to search out any topwater fish available, hoping that if I found them, I could put the boys on them before they headed deep for the rest of the day. I did find abundant and aggressively feeding white bass and largemouth bass in the vicinity of Area 061 right at sunrise. I caught 16 fish in 18 casts and then left them alone so as not to draw a Saturday morning following of potlickers. It was now 7:04 — the next 26 minutes went by ever so slowly as I waited for the boys to show up just hoping the fish would stay up long enough to get them on ’em. At 7:30, Bob and Austin arrived — Wyatt was still doing the Army thing. I took grandpa and grandson back to see if the fish were still up and was relieved to see them still slashing bait on the surface. Both immediately got hooked up on topwater baits and wound up boating 13 fish in the next 75 minutes until the fish settled down around 8:50. This was a neat experience for Bob as he’d never caught fish on topwater before, nor had he seen fish feed so aggressively. By now, the wind was up to 17-18 and the clouds were nearly gone. By then, Wyatt called in that he’d made it to dockside, so, we picked him up, and, while there, did a little bream fishing with a pole and float just for Austin. He caught 2 shiners, 2 longear sunfish, and 2 juvenile bluegill. We then headed back out with all 3 aboard and began probing the depths for suspended fish relating to schooled bait. We found the magic depth today was 26-30 feet. The fish stayed reasonably active for a good long while — about 3 1/2 hours. Our first fish taken on downriggers was our largest of the day, a largemouth just a shade over 3 pounds, and the largest that Wyatt had ever caught. In all, we boated 38 fish on the downriggers including 33 white bass up to 15 inches, 4 largemouth, and 1 drum. There were a number of occasions where we had doubles on, and we really never had a lull in the action until they settled down at the end of the morning feed, around 12:30 or so. By the time the day was done, 73 fish had come over the side of the boat (including the 16 I picked up prior to my guests’ arrival). As we approached the courtesy dock at trip’s end Austin got to steer the boat a little and then got to hand-catch the sunfish we’d captured earlier and release them. This was a wonderfully enjoyable trip with some good people. Fished a half-day morning trip on Stillhouse today with Ronnie P. and his sons, Adam and Travis. All three run a family real estate and appraisal business in Killeen and are just very, very decent people. Wind: Winds were SSW at 8-10 as we hit open water this morning and slowly ramped up to about 17 by 9:00a, peaked just shy of 20mph by 11:30, then scaled back to about 18mph for the remainder of the trip, turning SSE around 1:00p. Skies: Skies were partly cloudy in the morning with a grey cloud bank in the eastern sky which the sun took about an hour or so beyond sunrise to clear; skies cleared for good around 11:15a. I met the fellows dockside and right off the bat had them do a little practice casting so I could get a feel for their abilities on distance and accuracy and operate the boat accordingly. With a few pointers on technique with topwater baits, we were off to hunt for fish. Area 061 began to show some activity around 7:00a. There was already a fair chop on the water. With untrained eyes, the boys found it a bit difficult to identify breaking fish on the surface, but, before long they got through the learning curve and were throwing timely, accurate casts to breaking fish without too much assistance from me. We caught fish steadily right up until 9:00a. 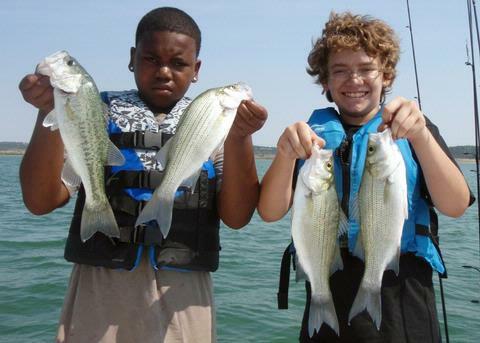 At first the fish were a mix of whites and blacks, transitioning to all black bass by the time the bite was over. We brought 29 fish to net before things settled down. After getting the boat squared away and taking a little snack break we rigged up for downrigging. We downrigged in four areas including Area 217, 463, 056, and from 458 to 465. At Area 217 we found an immense amount of bait hugging bottom with gamefish mixed in and over top of the bait. We did moderately well here putting 6 more fish in the boat, but I think there was so much bait that our Pet Spoons were not as attractive as they might otherwise be when food is more scarce. At Area 463 we found some fish and no bait, and put only a largemouth and a drum in the boat before continuing on. These fish were at 26-31 feet. At Area 056 we found a mix of white bass and largemouth suspended at 26-28 feet. We boated 5 fish in this area, then gave a try lift-dropping a slab to no avail. By about 1:30p the bite was getting soft, Travis was getting sunburned, and it felt like someone turned on a big hairdryer so we called it a day and headed back to the dock. Fished a half-day morning trip on Stillhouse today with father and son guests Bill and Tom C. from the Lake Travis area around Austin. Bill is a WWII fighter pilot vet who spent his post-military years in industry. Tom is a physics and chemistry teacher in the Austin area. Both were good-natured fellows and a wee bit competitive — more on that later. Wind: Winds were light from the S at around 6 at the start of the trip; they then tapered off to near calm around 7:45, then gradually increased to 18+ as the slowly turned SSW. Skies: Skies were fair at sunrise. Then went partly cloudy from ~8:40a to 10:15a, then cleared and stayed fair for the remainder of the trip. After meeting Tom and Bill at dockside we slowly headed out and I gave my safety talk and explained the techniques we’d be using as we went. I’ve found that the fish have been doing little on the surface until the sun has been up for a few minutes — this even pertains to the white bass which are normally a bit light sensitive and can get going pre-dawn on some days. We looked and listened over a lot of water from Area 461 to Area 222 and from Area 007 to Area 444. At about 6:50a, just after the sun had cleared the low cloud bank in the eastern sky, I spotted surface feeding fish in the vicinity of Area 061. 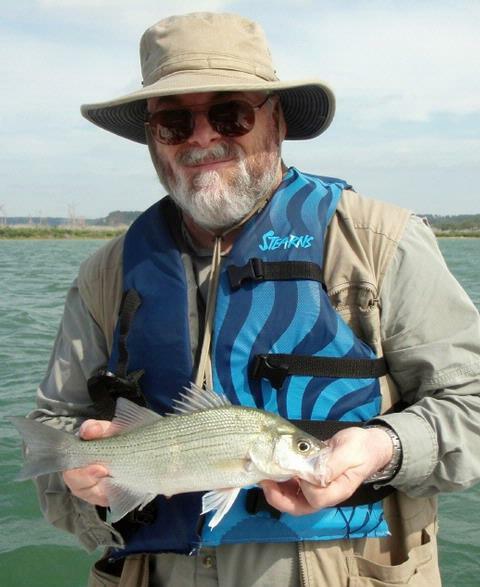 There was a mix of black bass and white bass, all feeding on very small ~1 1/4 inch long shad. Tom opted for using his ultra-light rig which he brought with him. I recommended throwing a Zara Puppy with that outfit and set him up on the back deck. Bill joined me in the bow and I started him out with a Cork Rig. The fish stayed aggessively feeding for approximately 45 minutes during which time we put 24 fish in the boat. At this point the sky was gettig brighter and the winds lighter and this brought the topwater nearly to a halt. We had a 30 minute span where we were making cast to “popcorn” fish showing briefly in packs of 3-4 fish and staying on the surface only a few seconds. Gradually, the skies clouded a bit and the wind began to pickup and move throught S to SW. 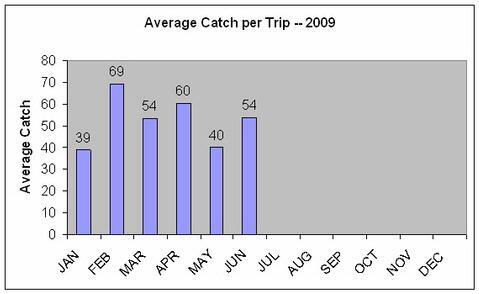 The surface action then picked back up, with largemouth making up nearly 100% of the catch at that point, and most in the vicinity of Area 461. We found a straight-line, hastily retrieved Cork Rig elicited the best response at this point. The winds were now 15-17+ and the fish were really difficult to spot. Had we not been on these fish earlier when sighting them was easier, we probably wouldn’t have been able to spot these fish at this point. We took the tally from 24 up to 39 fish by the time the winds were blowing too hard and the sun was shining too bright for any more surface action to occur. Around 10:15 we made a break from the topwater and changed over to downrigging. Tom was really interested in this technique. 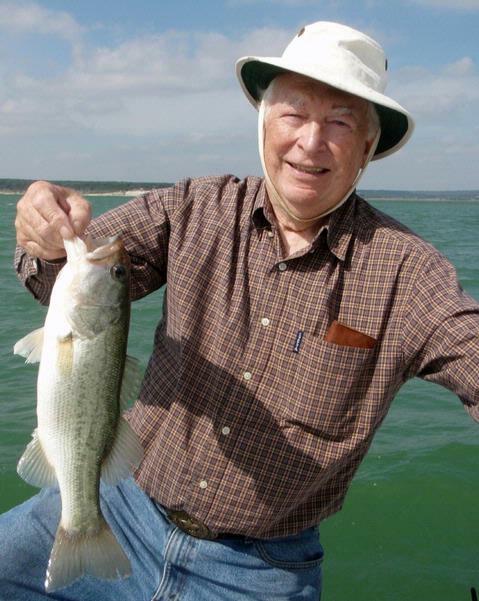 He’s often considered taking a crack at the Lake Travis striper population with downriggers, but has never yet given it a try. I tried to teach him about the particulars of this approach so he could replicate success on his “home waters” after our trip together. We started out downrigging at Area 464 in a N-S elipse. We saw scattered bait and scattered gamefish here, and broke the ice with 3 largemouth all on Pet Spoons. Knowing we could find more bait and more fish elsewhere, we left this area and headed to Area 217. As soon as we cleared the 25′ contour mark, the bait was all over the place and the gamefish were mixed right in. We stayed in this area and on these fish for the remainder of the trip putting 15 more fish in the boat on twin ‘riggers with Pets tied on. The magic depth here today was 24-26’. We landed a 50/50 mix of whites and blacks. Our best two white bass, 15 1/2 and 15 1/4 came out of this area, and 2 of our best 3 largemouth, going 2.75 pounds and 3.125 pounds, came out of this area as well. By 11:45, the morning feeding window was just about completely closed so we called it a good day and headed back to the dock. Now, there was some interesting wagering going on between father and son that I feel compelled to report on. It seems that after Bill caught the largest fish of the trip (up to that point) he bet (really proclaimed) that the one catching the biggest fish would be owed $10 by the other. Tom then proclaimed that was all fine and good, but that the one catching the most fish would be owed $20 by the other (of course, Tom had clearly landed the most at that point). Finally, by trip’s end, and unable to resolve who owed whom what, it was agreed that the one catching the last fish would be the “winner”. That honor, and rightly so on this trip taken in honor of his birthday, went to Bill. Congratulations, Bill!! 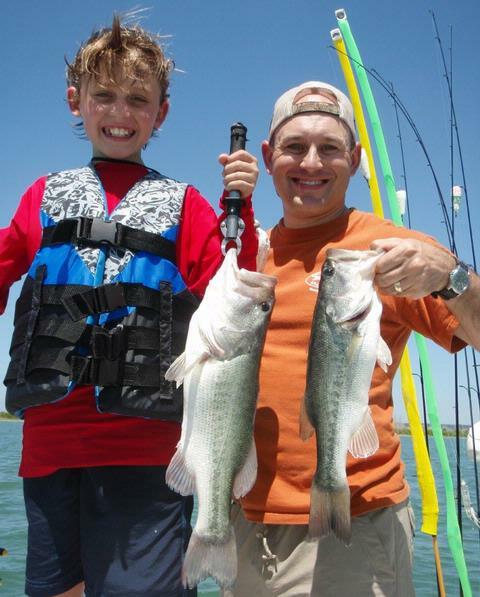 Fished a half-day morning “Kids Fish, Too!” trip on Stillhouse with David B. (Dad) and his two boys, Jack and Jay, of Temple. Dad and Jay and the catch of the day. Wind: Winds were from the SSE at around 12 at the start of the trip, but turned S, then SSW by 7:30. Skies: Skies were grey through approx. 9:15, then cleared a bit to most cloudy. After meeting David and the boys at the courtesy dock, we went over a few basic safely rules and then went right to work at dockside with bream poles catching a few sunfish as largemouth bait if the conditions called for it. The boys were excited to catch the sunfish, 12 in all, consisting of a mix of green sunfish and bluegills. After putting 9 sizeable sunfish in the livewell, we headed out to search for fish. Since the sunrise was obscured by fairly heavy grey clouds and since the wind had an easterly component, I started off with the downriggers down in the vicinity of Area 204 to 459. After about 10 minutes we hadn’t come up with anything, so we halted things and did some casting lessons with the closed face reels in hopes that we’d encounter some topwater action at some point. The boys did just fine after a few practice casts, so we racked those rods up and returned to downrigging and again saw gamefish and bait, but did not hookup. As I kept my eye out for action, I spotted in the distance, at Area 061, some “nervous water” that surface feeding white bass create as they pursue baitfish in a given direction. I glassed this action just to double check it and the game was on. I gave some quick instructions to David and paired him up with Jack on the back deck, and I paired up with younger brother Jay on the front deck so both boys had plenty of room to cast. We started off with blade baits. Jack did well with them, but Jay was struggling to make accurate casts, so I helped get the bait where it needed to be, and he retrieved it and began to catch fish just as well as big brother was. We experimented with Spook Jr.’s for a bit, but these were too big to imitate the small forage size so we quickly gave up on those, but not before Jay caught 2 fish at a time on his Spook! Overall, we caught a 50/50 mix of white bass and largemouth. We had boated 19 fish by the time the grey skies began to clear just a bit. At this time, the consistency of the topwater faltered a bit and the white bass activity diminished. What largemouth we saw were well-spread making it a difficult task to keep the boys on the fish. We returned to downrigging for a spell and both boys got to catch a fish on that equipment. Then, we had an increase in both wind speed and cloud cover, and this seemed to spur the fish back on. Given the now choppy water conditions, I felt a Cork Rig was going to be the best bet, and rigged both boys up with that. They both quickly got the hang of it and literally began to land one fish after another after another as the largemouth absolutely went on a tear. By the time the clouds dissipated and the winds slacked off bringing an end to the feeding frenzy around 10:30, the boys had put a total of 61 largemouth and white bass in the boat. 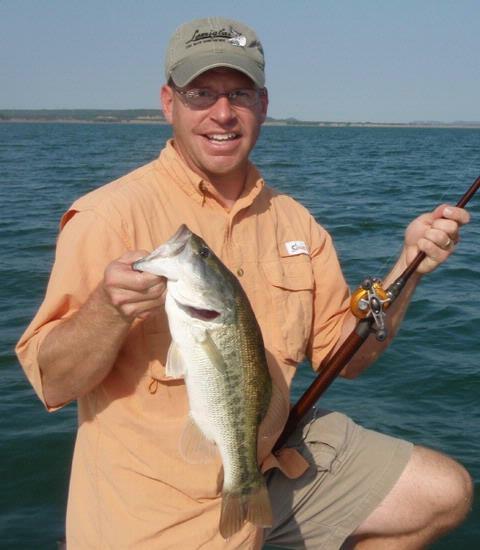 About 25-30% of the largemouth were just legal with the rest short; the white bass were all right at 11 to 11 3/4 inches. Realizing the best was behind us, we took a few photos to remember the trip by, neatened up the boat, and headed back to the ramp where the boys had a final bit of entertainment catching (with bare hands) and releasing all of the sunfish in the livewell we never needed to use for bait thanks to all the surface action. I complimented the boys on their attentiveness and let them know their success came due to their willingness to follow instructions well. The grand total, including the 12 sunfish, came to 73 fish caught today.